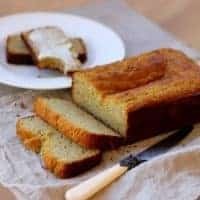 Moist and sweet banana bread just like Mom used to make – only grain-free! Preheat oven to 350 (325 if you’re using a dark or non-stick pan) and adjust the rack to the middle position. Grease a standard loaf pan. Place all the ingredients in the bowl of a food processor and process until smooth. Bake for 40-55 minutes until a toothpick inserted into the center of the loaf comes out clean. Cool in the pan for 10 minutes. Turn out onto a rack and cool completely. Enjoy!